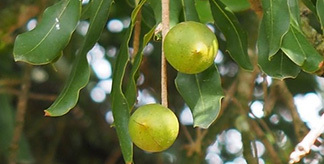 Improving macadamia tree yields by more than 50 per cent could be achieved by alternating varieties in rows and increasing pollinators, new research suggests. 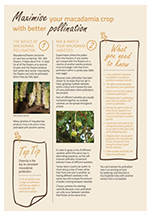 For the study – funded by Hort Innovation and Plant & Food Research and the Australian Macadamia Society (AMS) – researchers conducted a trial in a Bundaberg orchard which investigated pollination impacts on four different nut varieties. The trials showed when researchers hand-pollinated flowers along rows of different varieties, in almost all cases (44 of 47 trials), more than double the nuts were produced compared to those not hand pollinated. This suggested that when pollinators, particularly bees, had the opportunity to transfer pollen between different macadamia varieties, similar results could occur. Hort Innovation chief executive John Lloyd said these findings complement a range of efforts underway through the grower-owned not-for-profit company. “The consumer appetite for Australian macadamia nuts is insatiable with a trade-focussed agenda seeing the export value jumping 66 per cent between 2015 and 2016 to $253M,” he said. Lead researcher, Plant and Food Research pollination scientist Dr Brad Howlett, said the project also uncovered important early findings about pollinators. “Honeybees are the most common macadamia pollinators but we also see stingless bees, lycrid beetles, soldier beetles and flies,” he said. Dr Howlett said growers needed to choose varieties for planting carefully because pollination from one tree to the next can only occur between varieties that flower at the same time. AMS chief executive Jolyon Burnett said insect numbers are affected by weather and surrounding habitat, so it is important for growers to know what is happening in their orchard to make the most of surrounding pollination services. “Monitoring insects visiting flowers will allow growers to adjust their strategies to increase the number and consistency of flower visits across their orchards,” he said.